You’ll still find lots of good information on this page. In fact, there are links to items here from several other pages on the site, for the simple reason I believe your job can get a little easier from what you’re about to read. Scroll down and stop whenever a topic catches your eye. Or use these links to move quickly back through the news archive. Here's a cultivation idea that works equally well for charities AND membership associations. Your donors or members will be more generous and more loyal when you share relevant content. And it's important to realize that your idea of relevant may or may not match theirs. How do you find out what they think is relevant? Ask. Survey your donors or members and ask what they want to read and hear about. I know it's likely only a relatively low percentage will respond, but you still ask. And after the results are in you announce: "You told us what you're most interested in and so here are the topics we'll focus on in response to your request . . ."
This confirms that you take action based on what they say . . . it proves their opinion counts . . . and you'll get more of them to respond in future surveys. Plus this starts to build loyalty. And it's definitely cultivating and treating your supporters in a very nice way! Here are a few examples of questions. What are your favorite newsletter articles? What is most helpful to you in your work? With regard to charitable nonprofits, a very recent study reveals: "People would be willing to give money to charities, and even give a greater amount of money through online donations. But only if it was easier for them to find out from the organization's website what its mission and goals were, and also its plans for spending the money." This came from a Nielsen Norman Group study titled, "Donation Usability: Design Guidelines for Improving the Donation Process and the Usability of Essential Information on Charity and Non-Profit Websites." This was a user-experience study where they observed potential donors struggling to find information in order to decide whether to donate, and how much to donate online. This is why your home page must be very carefully designed - in terms of content, graphics, and more specifically how much information is on this page. The study revealed that if people did not quickly find these few key pieces of information on the home page, they were FAR LESS LIKELY TO DONATE. Didn't even see the donate button (17%); they couldn't find where to donate. This is again because of over-formatting and too much "stuff" on the home page. Nielsen estimates that if nonprofits fixed these factors that hinder donations, ". . . they could easily double donations." Here is another article I've written to help you improve nonprofit website usability: How to Boost Usability of Your Nonprofit Website . There are essentially 6 types of gifts your nonprofit can ask for. How many are you targeting in order to help grow your organization? How often do you send out an Online Press Release? An economic and very effective tool for creating buzz about your organization is an online press release. Some charities and associations send them out as often as weekly. Now weekly may seem overwhelming. And if so, I recommend you strive for a monthly schedule. Pick a date each month - say the 2nd week of the month - and give this internal deadline the same weight as a direct mail campaign. Then stick to this schedule unless a breaking story dictates you send one out immediately. Stories work simply because people like stories! And using this approach also means less work for the journalist, blogger, or publisher. This in turn means it's far more likely your press release will get re-published. And isn't this your goal? Another point I want to emphasize is this: One example of how to make your press release newsworthy is to tie it to a current event. In the summer of 2008 I took advantage of this concept with a press release for my own business. In it I commented on the latest animated Star Wars movie, "The Clone Wars" released that summer. I connected the movie to fundraising for nonprofits. You can read my press release here. Sending out quality online press releases at least once a month will attract more donors to your charity; or draw more members to your association. They can help you raise more money. Does your association connect "personally" with your members and prospective members? As a professional association you realize that the marketing communications you create fall into the B2B marketplace (i.e., Business-to-Business). But that absolutely does NOT mean your copy should be cold, stiff or formal. You're still writing to individuals . . . to a person. And if you're inviting this person to join your association you'll enjoy more conversions if you send a warm, personal invitation. "Acme Association's continuing education programs assist members with life-long learning. We offer more than 275 continuing education seminars and computer workshops across the country in a variety of technical, management, and regulatory topics. Acme programs can help you meet your state's continuing professional competency requirements ..."
And the copy also MUST be member-focused. Don't send out letters, emails, and ads that shout "ME, ME, ME." Instead send out messages that are about the reader and for the reader. Take another look at the before and after example above. Do you see the difference? Writing in a warmer, more personal reader-focused tone is easier said than done. However, once you master this copywriting skill I believe you'll see a nice increase in response and conversions to your marketing messages. Does your charity nonprofit website have a split personality? Quickly understand that in the context of this article, having a split personality is NOT a bad thing. Some nonprofits have the added challenge of creating a website for at least two very diverse audiences: 1) your donors and prospects; and 2) the people you serve through your mission work. A couple examples of nonprofits with dual-purpose websites are domestic abuse shelters and health clinics. Recognize that each audience is coming to your site for totally different reasons and often seeking different information. This means the copy, design, layout, and navigation of your website needs to take this into account. If you fail to create a website that's EASY for BOTH distinct audiences to use . . . if you fail to make it EASY for each of them to find the information they want . . . then you will lose visitors; lose donations; and help fewer people. This doesn't mean you need two different websites! But again, you must consider the unique needs of every target audience (unique group of users) in the design and content of your site. Perhaps you first design two different sites on paper. Then determine how best to combine the two into one site that maintains great usability for both groups. This "paper design" technique could also be used to identify improvements to your existing site. Then have some people from both target audiences test your site. They'll know what changes are still needed. And this is far superior to you guessing about what ought to be changed. Now just might be the time you can afford some media coverage for your nonprofit that wasn't possible before. What do I mean? Seriously consider advertising on television and radio. Some charities are paying 50% less than what they did last year to get advertising spots. You may not have the budget that Operation Smile, St. Jude's Children's Hospital or the Paralyzed Veterans of America do . . . but that doesn't mean it isn't worth exploring an ad on a few local or regional stations. And don't accept the first offer the stations make. The broadcasters are eager for revenue and the fact that you're a nonprofit is yet another reason to give you special pricing. At least bargain for it. Finally, don't forget traditional print such as newspapers. They too are hungry for revenue. But whatever you do, it all comes down to telling your story in a captivating fashion. Tell your story in a way that tells prospects that your mission is worthy of their financial support and exactly how they can make a difference with their gifts. April of each year brings National Volunteer Week in the United States and Canada. This event holds a plethora of opportunities for exposure to the public. Whatever you do, gain publicity by telling your Volunteer Week story through online press releases. And as I mentioned in my February article, be sure to leverage your stories and also share them in your direct mail campaigns, website, blog, and so on. These two websites offer resources to help you recognize your volunteers, and to organize more volunteers during this special annual week (or any time of year). Are you leveraging your content? Just about anything you write can be used in a variety of ways. A story in a direct mail piece also gets coverage on your website. A blog post goes out in an email. Or an interview goes on your website as a podcast. Transcripts of the interview are used in your blog and in email. Minor edits to existing content gives you leveraging power that I hope you're taking advantage of. Remember, any one person doesn't see (or at least they don't read) every thing you send out. And even if they come across a story a second time, it will be in a different context and your donor may get more out of it the second time around. In any event, they certainly will NOT be upset because you re-purpose your content. And it will save you time and resources because you won't need fresh content everywhere you turn. You'll get a bigger return on your investment by leveraging content. What a relief! Random Acts of Kindness Week rolls around every February in the U.S. This is great idea for an online press release. Just make the right connection to your organization and you'll get publicity. Perhaps you can have a contest among your staff on who gets the most members of their family involved. Single people and married can all participate when you include distant relatives. In other words, husbands and wives; brothers and sisters; aunts and uncles; cousins; and so on. It doesn't matter where anyone lives. The member of your staff notifies their own family. Then family members report back on what they do during Random Acts of Kindness Week. At the end of the week participants of your staff send in their tally of good deeds from their family and the winner is based on either the total number of acts, or the number of family members involved. Or perhaps choose a winner from each category. These good deeds may or may not be directly related to your nonprofit mission. But they'll show the depth of benevolence and kindness of your staff. How you also "give." And it all makes for a great story. Write up a great story and you'll get press coverage. Especially if you include a few captivating photos. You can send out a release announcing the contest. And another when it's completed. That's two opportunities to increase awareness of your mission. Need help crafting an online press release that get's noticed? Just drop me a line. I'd be proud to help your mission prosper even more. Wealthy Americans tend to stop giving to charities because they feel disconnected to the charity (#1 reason cited by 57.7%); or they were being asked too often (#3 reason cited by 42.3%). These were among the primary reasons given for no longer donating in a survey done last July and August (prior to this fall's Wall Street collapse). It was conducted by the Bank of America and the Center on Philanthropy at Indiana University. You know better than I that there's a delicate balance between helping donors feel connected and asking for donations too often. This gets back to donor cultivation and including communications in the mix without an "ask" of any kind. Other ways to help them feel connected are inviting them to come for a visit. See what you do first hand. Offer more volunteer opportunities. Get their children involved in your organization. And as always, make it crystal clear in every communication how their donations are making a difference. Be specific on what is getting done thanks to your donors. Cause marketing has many faces. First, it seems the greatest successes come when there's a somewhat logical link between the mission of the nonprofit and the product or service the corporation offers. One example is how Dogpile.com (an Internet search engine), gives a penny to the American Society for the Prevention of Cruelty to Animals every time a search is made on Dogpile. Supporters download the Dogpile toolbar and then they indirectly help the charity with each search. Here's another "face" of cause marketing. About 79% of consumers are more likely to switch from one brand to another - given similar price and quality - if the second brand is affiliated with a good cause. This was revealed in the 2008 Cone Cause Evolution Study (by Cone, LLC which is a brand consultancy firm in Boston specializing in cause marketing). And for those surveyed who were 18-24 years old, they were 88% more likely to switch. The American public is very receptive to cause marketing. Almost 2 out of 5 people purchased a product associated with a cause in the 12 months prior to the survey. And 85% of those surveyed said it's acceptable for companies to involve a cause in their marketing. Done wisely, this is a win-win for both the nonprofit and the for-profit business. And you might want to also encourage your corporate partner to participate in other ways, according to the survey. Suggestions included paid time off to volunteer as well as company-sponsored volunteer days. It seems we're on our way to a recession. And with the news media pounding that doom and gloom message into our heads, people will begin to act accordingly. But my pet peeve with the negative media influence isn't the point of this article. Here's my point . 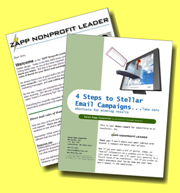 . .
You may find it wise to begin your holiday fundraising campaigns a bit earlier than usual. And you may even send out an extra appeal. This is what a number of organizations have underway. Try some new media such as text messaging. Perhaps include more requests for smaller donations. What about combining efforts with your "competitors?" You've got a lot at stake. Keep doing what has always worked for you, but seriously - and carefully - consider some new tactics as well. If your corporate sponsors are disappearing, seek some in industries "less" affected by the economic downturn. For your annual gala events you might consider a smaller more intimate version instead of cancelling altogether. I've read where some organizations are hosting an event in a board member's home, for example, with a smaller group of people invited. Hope that gives you a few ideas that will help you to meet your goals. Good customer service directly relates to the success of a business. And good donor recognition directly relates to the success of a nonprofit organization. I just read about a survey (for-profit sector) where 87% of consumers said they've stopped doing business with a company after getting poor service. That's an increase over 2007 when 80% said they stopped; and also up from 2006 when 68% said they stopped after poor service. That's a strong upward trend. And I believe those numbers would be equally high if a similar survey was done within the nonprofit sector. I say this because human nature follows patterns. People are unlikely to be that intolerant of poor service in one area of their lives, and totally accepting of it in another. Nonprofits also provide customer service. Your customers are donors. How are you treating them? Are you giving them the red carpet treatment? How do you really think about donors? Do they just represent a "check" to you? Or do you genuinely value them beyond the money they send? In the U.S. alone, there are 1.2 million nonprofits registered with the IRS. Donors have many, many choices. Without customers a business collapses. Without donors a nonprofit collapses. What extra effort are you making to ensure your organization is the best choice for donors? Seniors are online - so says a survey by Gfk Roper Public Affairs and Media for Evercare. Nonprofits and marketers are wondering whether they'll be able to keep in touch with donors online as they get older. The trends are promising. The survey queried consumers age 99 and older. Wow! One out of 10 said they use the Internet and 7% use email. That may not seem significant but with this sample group . . . it is significant. The experts say it shows where this specific demographic is headed. By 2010, there will be 100,000 Americans age 100 and older (U.S. Census Bureau). And the Baby Boomers will keep driving those numbers up for about the next 30 years. Therefore, it appears that as your donors age you'll still be able to reach them online. TIP: Remember, what matters most is giving donors what they want; what they believe is important. And making it easy and convenient for your donors. Address their needs first - donor centered. As a fundraising copywriter and marketer I have to constantly remind myself of this. It's so very critical. And because of its importance I recommend you consider having more than one website in the future. One site tailored to seniors (test it; but perhaps age 70 and older), and another to folks that are younger. Depending on your mission, you may even want to segment this farther. Again, it's something to consider. I attended a direct marketing conference at the end of May where I spent serious time soaking up the latest online direct marketing trends and tactics. This area of marketing changes with blinding speed. It’s also easy to feel overwhelmed with the technology side of it. You can always find help with the technical stuff. Please make sure you concentrate on what tactics best fit into your marketing and fundraising strategy. In order to continue providing the best copy I can to you, I also need to keep current. Many factors play into writing strong copy for your email campaigns and your website. Here are some of the topics or sessions I attended: An incredible presentation on what is working now for SEO results; marketing with online video; Google Adwords; how to generate website traffic with social media; and mobile marketing (i.e., communicating with cell phones and other mobile devices for cultivation and advocacy). Oh, and I’ve lined up a strategic partner to help me support client’s needs for online video. He’s got the technical side mastered and he’s also a breeze to work with. I’ve worked with him on a number of projects. So drop me a line or call if you want to strengthen your online presence through video or other tactics. I’ve been reading a number of articles lately that talk about having your writing – your fundraising copy – align with the donors’ personality. Good idea. It’s part of donor cultivation. So how do you do it? Hopefully you have strong demographic and psychographic data on your major donors. This information is critical to communicating correctly with these very important people. And have your “customer service” trained staff take notes during every phone call and encounter with these people. In addition to that file segment, I’m confident you realize that no two donors are exactly alike. But they can be grouped by 4 basic personality types. I’ve seen several different labels applied to these 4 types depending on who the author is. The labels aren’t what are most important so I haven’t included them. “Just the facts, ma’am.” Cut right to the chase and tell them exactly what you want them to do. Bottom line. Very analytical. Love details and plenty of documentation. Seldom fully satisfied that you’ve told them all they want to know. Very sensitive and people oriented. Strong desire for messages of warmth and tenderness; relationships. You want your messages to include everyone. One letter or email may not fully address the needs of all four types. However, you can put something in it for everyone. Your newsletter (print or online) can certainly have articles presented in different ways to mesh perfectly with your different donors. Email is another media which allows you to directly tailor communications to align with each group at almost zero cost. Regardless of the cause, your donor file will be a blend of all four personalities. Keep this in mind as you write your fundraising copy for print or online. Ever struggle for an idea, a theme, a new twist, or for a reason to send a communication to your association members or to your donors? With a little creativity you can choose from hundreds of ideas to tie your nonprofit mission into. Every day, week and month something “special” is going on and being recognized. These special events range from month long observances (e.g., American History Month, National Garden Month), to week long (e.g., Random Acts of Kindness Week), to special days (e.g., Polar Bear Day or Tell a Story Day). There’s such enormous variety that I’m confident you can find an event with an indirect tie to your mission if not a direct tie. Here are a few links where lists of these special events can be found. I’ve noticed a bit of inconsistency on dates, so double check your data with more than one source. As a fundraising copywriter I’m always grateful for any sources of ideas. I’ve found sometimes just looking over the list can trigger a creative solution to my project. Hope you also find them helpful. I attended a one day workshop focused on public relations for nonprofits. It was a local event conducted an organization I’m a member of: PRISM (Public Relations Individuals in Southern Maryland). It was sold out with some nonprofit folks still hoping to attend. Plus there were lots of questions during each session and good discussions on the breaks. All this tells me nonprofit organizations view public relations (PR) as a priority to their overall success. Rightly so. A good PR program includes your website, special events, press releases, all communications with donors and members, branding, possible use of a mascot, and getting press coverage. And of course you want a consistent image presented on all fronts. Yes, PR is part of your fundraising efforts. And of course, great copywriting is at the heart of it all. Proof. Proof. And proof a half-dozen more times. Odds are we’ve all done it. Sent something out in the mail (print or electronic) and missed a big mistake. Sometimes it’s a typo. Or it could be how something is printed. Or perhaps a primary element of the package is eliminated. Another possibility is a very confusing order/reply device. I received something at my home that fits into this category. I won’t mention the nonprofit organization. I will say it has been around since the late 1800’s and is internationally known. Anyway, I received an invitation to renew my membership for another year. Problem was that although the letter copy promised it, there was no return envelope provided. Nor was there any information in the package on who to mail my reply card back to – no address or contact information. Therefore I really couldn’t reply without a whole lot of effort and extra time. Oops. Check those packages carefully. A lot of hard work and revenue can be lost from these snafus. I like helping my clients. And today I’m announcing a new tool designed for that very purpose: I’ve added a resource section to my website. I’m a humble fundraising and sales copywriter who strives to exceed my clients’ expectations, and also serve those who haven’t yet retained my services. Both objectives link to the primary goal of the resources section. My goal is for you to find at least two useful pieces of information to boost your nonprofit fundraising results. Either directly from something I’ve written, attending an event you learned about here, or perhaps indirectly through a vendor resource. And some of the listed vendors also provide services to the for profit business sector. So if you fall in this category, I encourage you to also take a look. “Hats off” to the Direct Marketing Association Nonprofit Federation (DMANF). They hosted a terrific conference January 25-26, 2007 in Washington D.C. . . . the 2007 Annual Washington Nonprofit Conference. Whether you’re a humble fundraising copywriter like me, a creative services director for an agency, the development director of a nonprofit, or anywhere in-between, this conference is for you. Highlights included the two keynote speakers: Vicki Escarra, President and CEO, America's Second Harvest. And William P. Magee, Jr., D.D.S., M.D., Co-founder and CEO, Operation Smile. Both were gifted speakers with powerful messages to share. In addition, we all enjoyed an informative and humorous talk by Larry May, CEO of Direct Media Inc. Mr. May was honored as the recipient of the Max L. Hart Nonprofit Achievement Award. A great diversity of topics and experts made choosing which session to attend quite a challenge. All the sessions I attended were excellent! And based on conversations with other attendees, everyone was very glad they came and they learned a great deal. We all acquired new tools to make our work easier. I recommend you block out your calendar to attend this event next year. I’ll let you know the dates well in advance in "Karen's Fundraising Tips" newsletter. Many thanks to all the folks at Direct Response Solutions who put together an exceptional seminar yesterday in Baltimore, MD. They delivered a seminar rich in content at a very reasonable price. I imagine the nonprofits also appreciated that there was no 'selling' from stage or anywhere else in the room. Each fall DRS holds direct response fundraising seminars in 4-5 locations around the country. Definitely worth your time to attend. Ill keep you posted on next years schedule in my monthly newsletter, "Karen's Fundraising Tips." I just spent two days at the 2006 Bridge to Integrated Marketing and Fundraising Conference in Washington D.C. This content rich event was co-hosted by the Association of Fundraising Professionals (D.C. chapter), and the Direct Marketing Association (Washington D.C. chapter). The primary target audience was nonprofit organizations. However, anyone working with nonprofits can definitely benefit by attending. Topics included anything and everything related to marketing, creative efforts, raising funds, donor relations, operating a nonprofit, leadership, etc. I strongly encourage anyone working for or supporting a nonprofit organization to seriously consider attending this event next year. Ill keep you posted on it in my monthly newsletter, "Karen's Fundraising Tips." I personally found it very worthwhile and I heard nothing but rave reviews from all the folks I met and spoke with. At the Clayton Makepeace 2006 Power Marketing Summit, Karen Zapp was announced as a recipient of the “2006 Copywriter’s Challenge” Award (3rd place category). Competition was keen, including some of the leading copywriters of the country. The announcement was made during the Gala Banquet on Friday evening. The Power Marketing Summit was held April 20-22, 2006 at the Marriott Renaissance Hotel in Washington D.C.
"This course is, in my view, one of the very best courses from AWAI. Incredibly dense; solid, useful information. - Nick Usborne, author of "Networds: Creating High-Impact Online Copy"
TIP - Video is a powerful donor cultivation tool. Don't assume it's too complicated or expensive. Get some facts first. I invite you to give me a call and I'll outline how easy it can be for you. And please take a look at the videos on this page for a sample of what's possible. TIP - Little details are vital to a story. So dig deep, for example, to find out about the tear that came to a father's eye when he locked up on the first night he and his family went to bed in their new, safe Habitat home. Or the children tripping over each other as they dashed off to excitedly tell their friends that their mother received her diploma for learning how to read and write today. Those details bring a story alive; stir deeper emotions; paint vivid pictures; and boost your response.